We are investigating the effects of the nonlinear interaction between THz and optical pulses in air. The experimental layout follows the scheme proposed by Dai and coworkers : the THz pulse is overlapped, in air, with a probe, 800 nm pulse. 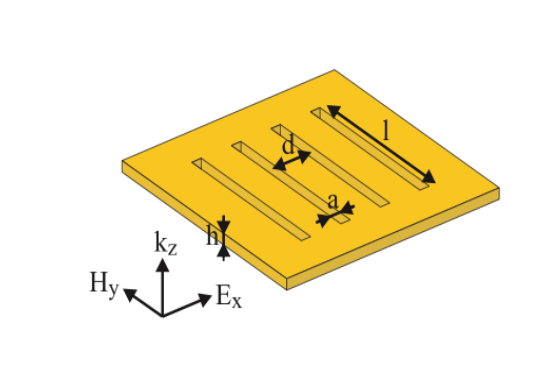 The electric field of the THz pulse breaks the isotropy of the air medium and creates an effective second order nonlinearity, χ(3)eff ∩ χ(3) ETHz, with ETHz being the THz electric field. 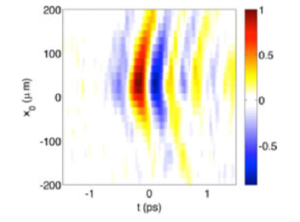 The probe pulse therefore generates an “Electric-Field-Induced” Second Harmonic (EFISH) signal. Differently from the standard Air-Biased Coherent Detection (ABCD) technique [1,2] where the Second Harmonic (SH) of the probe beam is measured with a photodiode, we spectrally resolved the wave-mixing signal. 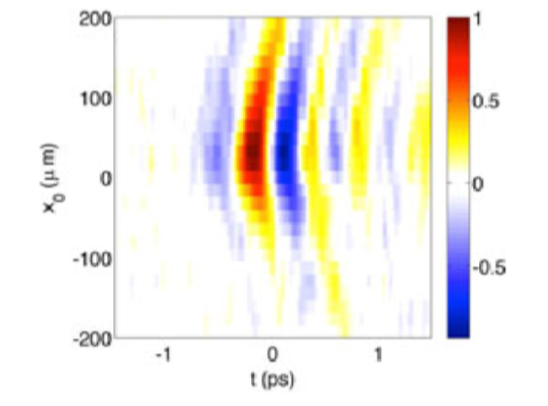 Wave-mixing of terahertz (THz) waves and optical pulses mediated by a Kerr –χ(3)– nonlinearity has been investigated in gasses as a mechanism for THz detection and amplification (see e.g. [1–3]). 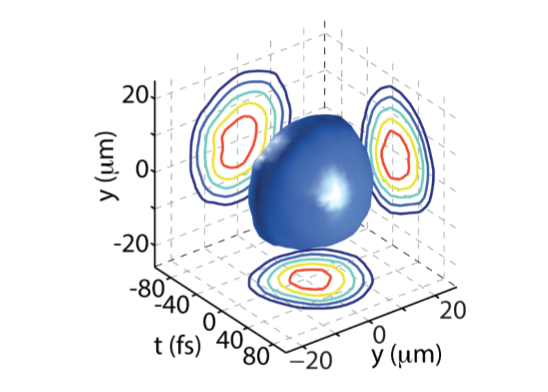 A similar process in bulk samples has been exploited for the detection of long-wavelength radiation, and is typically referred to as electric field induced second harmonic (see. e.g. [4–6]). Furthermore, the possibility of generating THz light from bulk Kerr media has also been theoretically discussed [7,8]. 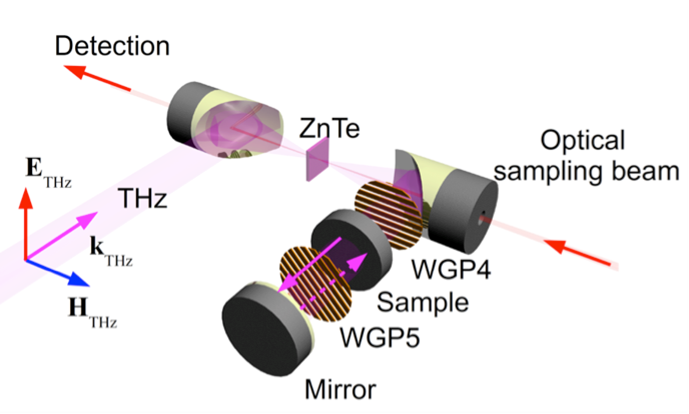 We investigate the four-wave-mixing (FWM) process of intense THz and optical fields in large bandgap dielectrics both for generation and detection purposes. 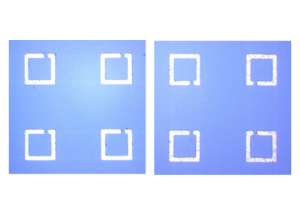 Terahertz (THz) imaging emerged as a distinguish technique for material analysis and characterization in security, military, biomedical, pharmaceutical and aerospace sectors due to its significant capability in extracting the information of material thickness and density . 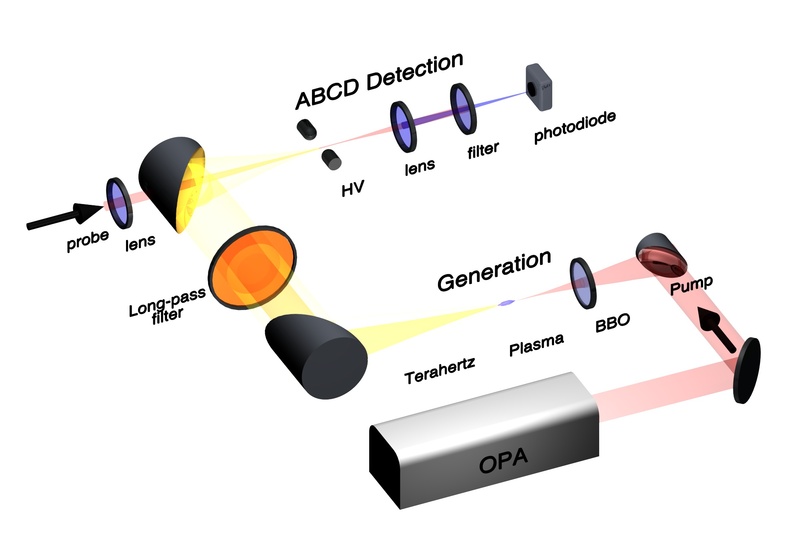 Spatial resolution of THz imaging is strictly limited due to its long wavelength (100-1000um) lies between the infrared radiation and microwave radiation. Several near-field techniques have been successfully implemented to obtain subwavelength resolution in THz imaging, involving the subwavelength apertures, tips, or other spatial discrimination in raster scan on the sample to be imaged [2,3,4,5]. The performance of conventional metamaterial designs typically suffers from low quality (Q-) factors owing to ohmic and radiation losses. 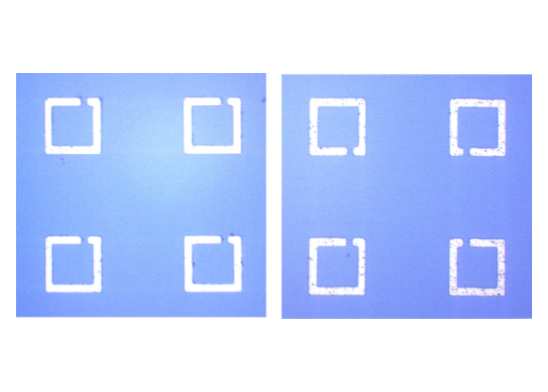 Hence, a drastic improvement is desired that can be achieved by novel and innovative structures for metamaterial unit cells. Asymmetric double split ring resonators (aDSRs) have been proposed at microwave and terahertz frequencies in order to achieve high Q-factors in a planar structure . 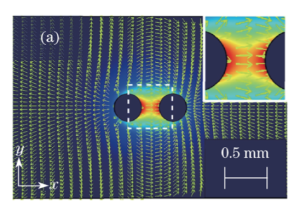 In this project, we show that a super cell made from four mirrored asymmetric single split ring resonators (mASRs) sustains an ultra-sharp inductive capacitive (LC) resonance feature that arises from the antiparallel currents excited in pairs of mASRs .